Wales and Ospreys loose-head prop Nicky Smith is expected to be out for up to four months through injury. 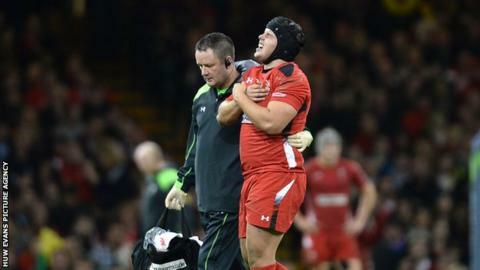 Smith, 20, had to leave the pitch in pain shortly after coming on as a replacement to win his second Welsh cap in the 34-16 loss against New Zealand. He is to undergo an operation on a torn pectoral muscle. Ospreys have two more international loose-heads injured, with Duncan Jones facing up to six weeks out and Ryan Bevington a further two months. Bevington, 25, needs a further operation on a long-standing groin injury, while Jones, 36, suffered medial ligament damage to his knee in last week's 25-16 loss away to Ulster. There was further bad news for the Liberty Stadium side with wing Jeff Hassler suffering a "significant knee ligament injury" during Canada's game against Romania. A decision on treatment for the 23-year-old will be taken next week after consultation with a specialist. Ospreys medical performance manager Chris Towers confirmed Smith will undergo surgery and said "he is looking at up to four months recovery post operation". Coach Steve Tandy had sympathy for Smith, whose impressive form this season has earned him a place in the Wales squad. "It's disappointing for him," said Tandy. "We'll miss him through the next round of the Champions Cup and Christmas period which will be a big loss for us. "But it's someone else's opportunity. Nicky will be concentrating on his rehab and getting back up to speed as quick as he can." Tandy says the injuries at prop could provide Gareth and Mark Thomas with their chance. "Mark's had limited opportunities but he came on at the weekend," said Tandy. "Gareth's been doing extremely well in training and probably is unfortunate that he hasn't had a little bit more rugby than he already has." Ospreys are also waiting to learn whether any fringe players will be released from the Wales squad for Saturday's Pro12 match away against Leinster. Back-row forwards Dan Baker and James King were made available by Wales to play for the region in the Pro12 last week.